Once there was the perfect lover, once there was a war, now there is war always. 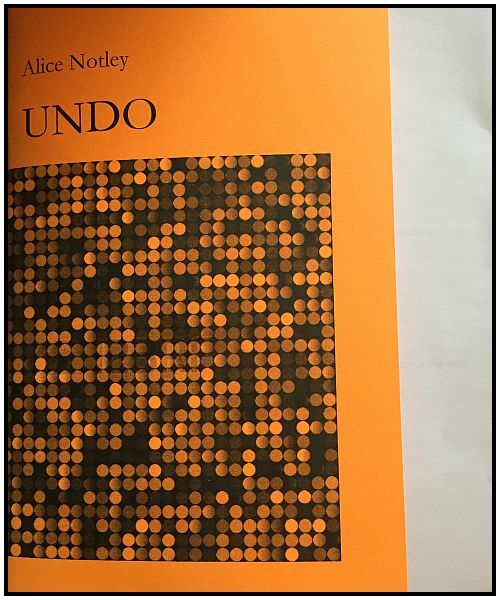 UNDO is a poetic treatise in the vein of the New Age Renaissance Republic of poetry, an enigmatic, rolling liturgy, a call to arms by Alice Notley and above/ground press. This work includes her previously published poem “Malorum Sanatio”. Alice Notley (Poet, poetry editor, educator, artist) born in Bisbee, Arizona, she has lived in the Mojave Desert, New York and currently lives in Paris, France. She has received numerous awards for her poetry, including the Griffin Prize, the Academy of American Poets’ Lenore Marshall Prize, the Los Angeles Times Book Award and the Poetry Foundation’s Ruth Lilly Prize. She is also a Poetry Editor of books and the magazines CHICAGO, SCARLET and Gare du Nord. Her latest book of published poetry is Certain Magical Acts (Penguin). The major themes and images in the poem are healing and golden sequins within a backdrop of war, death and many lovers. It is as if she is losing her religion and yelling at the sky. The poetry is enigmatic with new word juxtapositions and broken thought train, rolling out in long running lines of brilliance and ad nauseum. As if speaking in tongues, the poetry reads in convolutions, an affirmation, a denying of the affirmation, a pushing and pulling, a moving through the healing and brokenness of revolving lovers, a program of war. In this “apocalypse” poetry, the matriarchy is unbound and asking for change. As the violence rolls out in the shattered lives of the elite, the artists and every small town grif, this poetry is a mirror. A brilliant write, UNDO by Alice Notley.